“Ding, ding!” The South Lake Union Streetcar snakes through traffic, warning overconfident pedestrians. Inside, passengers read and gaze out the windows: calm, cool and collected despite the bustle of Amazon’s much-lauded “urban campus” set among one of the city’s fastest-growing neighborhoods. The 140-person capacity trolleys glide 1.3 miles from Westlake Hub to the lake’s southeast end, stopping 11 times ($2.25 for a single ride). Eventually this route will connect with the First Hill one, opening soon. 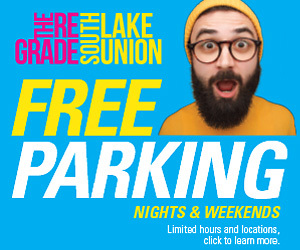 For now, grab a $4.50 day pass and use it to leapfrog through some of South Lake Union’s highlights. Start at the McGraw Square terminus, ducking a block south to spin through Nordstrom, the local shoe boutique that blossomed into a Fortune-500, upscale department store. 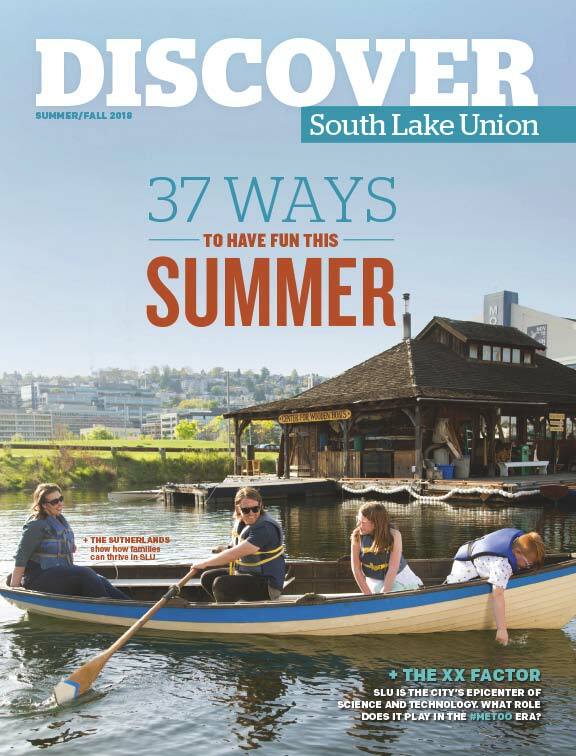 Then ride two stops up to the South Lake Union Discovery Center, overlooking Denny—Seattle’s first public park. Chart the area’s history through displays and an interactive model of the neighborhood. Fortify yourself at the next stop (Terry Avenue & Thomas Street). Grab brunch at Portage Bay Café, famed for its bar of breakfast sides: think nuts, whipped cream, seasonal fruit and organic maple syrup. Or stock up on street food—like roasted Mexican corn, newspaper-wrapped fish and Seattle’s first artisanal pretzels—at the Terry Avenue Saturday Market (10am–3pm, June to October). Zip over to Lake Union Park, a 12-acre former navy base, now anchored by the splendid Museum of History and Industry. Grab a 360-degree view of the city with the working WWII-era TANG periscope, then explore permanent exhibits on the Northwest and its innovative spirit. At the Historic Ships Wharf outside, salute the star of the film Tugboat Annie and the last vessel to escape the U.S. Pacific territory of Wake Island before the Japanese invasion: the Arthur Foss. Then keep the maritime mood going next door at the Center For Wooden Boats, which rents everything from canoes to sloop-rigged sailboats. Walk west across the park to Art Marble 21, a new take on the 750-seat World Sports Grille space. Some of the games remain—including pool, Skee-Ball and indoor bocce—and they’re all free to play. But the decor now honors its Roaring Twenties roots with chandeliers and coppertop tables. The restaurant also serves period craft cocktails, like the lemon-laced Bees & Basil (during Prohibition, citrus and honey often masked the flavor of bathtub gin). Southbound, the streetcar runs down Westlake Avenue. Window-shop the Tesla showroom, packed with sleek electric autos, and then stop by MadArt. This event space doubles as a large-scale studio: check to see if the artist-in-residence is welcoming visitors. Six Pronto bike stations dot the route for folks who want to mix things up. Buy an $8 day pass and shell out $2 for a helmet (mandatory in Seattle). All rides under 30 minutes are included in the price, while longer journeys—like the 6.2-mile Cheshiahud Loop around the lake—incur small additional fees. Finish the day by bouncing back to the Westlake Avenue and Virginia Street streetcar stop, then strolling over to Barolo Ristorante for happy hour (daily 3–6:30pm and 10pm to close). Bar-menu standouts include eggplant parmesan, sautéed mussels and the lamb burger. Or plunge into the full Italian dining experience with multiple courses, including Piemontese specialties like porcini-mushroom tortellini bathed in truffle-leek sauce. Nearby stands Dimitriou’s Jazz Alley, a Seattle institution serving up music, dinner and cocktails since 1979 (reserve ahead). One of the West Coast’s premiere clubs, it has hosted giants like Dizzy Gillespie, Oscar Peterson and the new “first lady of jazz,” Tacoma-born Diane Schuur. What better place to raise a glass to South Lake Union’s endless energy and reinvention? The 140-person capacity trolleys run 1.3 miles from Westlake Hub to the lake’s southeast end, stopping 11 times. Tickets are $2.25 for a single ride, or $4.50 for a day pass. The South Lake Union Streetcar will eventually connect to the First Hill Streetcar.